The world is going a little crazy right now. You’ve said that before, haven’t you? But no matter how crazy the times we’re living in are, I’m willing to bet if you go back a generation or two (or three or four), your relatives all had a time in their lives where they thought the same things. It’s easy to get stuck on all of this external stuff. The media simply won’t let us forget it. But what can you really do about any of it? Can you control the economy? Can you prevent businesses from going bankrupt, eliminating jobs, or handing out pink slips? Can you change the political environment we live in? Worrying about any of it will only give you a headache. Reinvention is all about making ourselves the best we can be. Because only when you are at your best can you do what’s best for you. 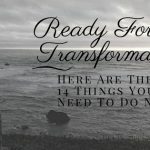 Reinvention is all about recreating the four most important areas of your life. Physical – Am I eating the right things, exercising every day, sleeping as much as I need? Emotional – Am I spending quality time with the people that mean the most to me and that I care about unconditionally? Mental – Am I stirring up the creative juices inside, learning new things and experimenting with ideas that challenge me and make me grow? Spiritual – Am I doing things that help me connect with my little place in the world? And you can’t just do each of those once in a while. They have to be a part of your everyday routine in order to make you the best YOU you can be! See, these four areas are under your control. The economy, politics, the world – they all move and change no matter what you do. If you spend your time on you, you can make big change in your life. And the more you change your life, the more influence you have over the things that matter the most to you. Change is inevitable. It’s going to happen no matter what. The world changes. You change. I’ve moved from banking, to accounting, to auditing. I’ve worked for the corporation, owned my own business. I’ve relied on a paycheck, created my own income. And through it all I realize every few years, I need a change. A BIG change. Like quitting corporate forever and opening up my own business. Like selling off my home, getting rid of two-thirds of my stuff and moving to another region of the world to slow travel for awhile. Like selling a business so I can follow my dreams of becoming a writer. But none of this would be possible if I didn’t work on the four core stances of reinvention every day. So what did I do to check off my four core tasks for today? I slept eight hours. I’m making a vegan lasagna for dinner. I had tea with my daughter. After a week of vacation, there was a lot to share. I wrote. I created a schedule of my fourth quarter writing goals. I began laying out my 2017 calendar and creating the books and programs I wish to write and create in the coming year. I centered myself with meditation and journaling. A little bit of yoga and walking brought everything into perspective. Without doing this every day, I wouldn’t be the best I could be. It takes work. I fall off the bandwagon every once in a while. But I realize, to be the best I can be, this is what it’s going to take. So I do it. Every day. Am I doing the right things physically to reinvent myself? Am I connecting with the right people to keep me emotionally healthy? Am I working my mind in ways that spur creativity and growth? Am I influencing the world in the way I choose?